September 25, 2018 / Mike Busch / Comments Off on Fix It Now! Sometimes I just can’t fathom what makes aircraft owners do some of the things they do. Particularly amazing to me are some of the mechanical problems that aircraft owners elect to live with rather than fix. Now I’m just as averse to spending money as the next guy (and probably more than most). In fact I’ve made something of a crusade out of saving money on aircraft maintenance, and for the past 10 years my company has helped aircraft owners save millions of dollars by avoiding unnecessary and excessive maintenance. On the other hand, when it comes to my own airplane, I have always had something close to a zero-tolerance policy about mechanical problems. When something isn’t right on my bird, it drives me nuts until I fix it. Almost always, I fix such problems right away rather than putting them off. My five decades as an aircraft owner has taught me that it’s usually cheaper to fix a problem sooner rather than later…sometimes a great deal cheaper. Not to mention that continuing to fly with a known mechanical deficiency can sometimes be hazardous to your health as well as your wallet. Shortly after I bought my airplane last year, I noticed a drip coming from under the aircraft which pooled just to the left of the nosewheel. 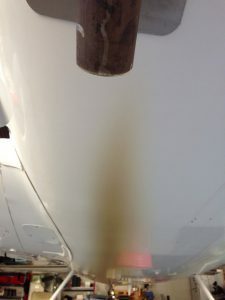 The drip occurred with the frequency one drip probably every five seconds while the aircraft sat static with the fuel selector on either the left or right tank. Obviously one of the very important shutdown tasks for me was to turn the fuel selector off in order to stop the leak. I never established whether the fuel leaked while the engine is running. After not flying for the past month, I went out to my airplane last week. The aircraft was leaking fuel despite the selector being in the off position. There was a big pool of avgas beneath the airplane, and the fuel gauges indicated that I had lost almost all the fuel in my tanks…at $4.75 a gallon! Not understanding why the fuel now leaked regardless of fuel selector setting, I started the aircraft, taxied it around to warm-up the engine and then left it at the maintenance hangar. I am being told by the very competent maintenance supervisor that originally it was simply a fuel selector gone bad. However, they are now telling me that given that the aircraft now leaks in any position, it’s also a bad engine driven fuel pump. Usually I’d say let’s fix the selector and see if that resolves the problem altogether but I am concerned about the fuel pump going out at some critical time. Please advise. Here we have an owner who knowingly flew his airplane for a year with a known significant fuel leak in the engine compartment. He only brought it to the attention of his mechanic when he could no longer stop the leak when the aircraft was parked by turning off the fuel selector. Now he’s asking whether it would be okay to fix the fuel selector and continue flying with the fuel leak in the engine compartment unaddressed. Good grief! I cannot imagine operating my LAWNMOWER with a known fuel leak, much less my airplane. What is this owner thinking? I don’t push the engines hard, running at 65% power or lower most of the time. However, despite a published service ceiling of 27,000 feet, the engines really don’t perform well over 15,000 feet. I routinely fly over that altitude, but the cylinder head temperatures get a little high, and the engines burn more oil. Sometimes I have trouble with the wastegates functioning properly at altitude, too, and I get some bootstrapping of manifold pressures (needle separation), which is unpleasant at best (because the props get out of sync), and is dangerous at worst (because the bootstrapping could be due to an exhaust manifold leak). So as a practical matter, I only climb over 21,000 if it is absolutely necessary. 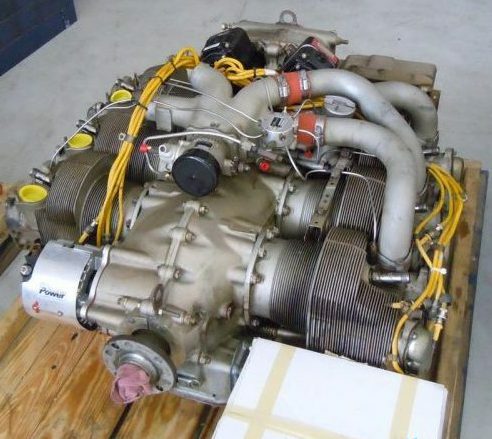 It baffles me how this owner can be sufficiently knowledgeable to recognize that his aircraft has a turbocharging problem that prevents it from operating properly at altitude, and even understands that the problem could well be due to an exhaust leak, yet continues to fly the aircraft with that known deficiency. On my departure from Pensacola on Sunday afternoon, I turned the key to start the engine (a Continental IO-520) and I could hear the starter motor, but the prop wouldn’t turn. It did twich slightly, but then just sat there. I have noticed frequently in the past that the prop turns a little and then stops and then a second or two later it continues. Once the prop starts turning, the engine usually fires on the first turn and starts right up. On my previous airplane, my A&P told me to turn the prop until I hear the click and it would help to start. So, I turned everything off, got out of the plane and turned turn the prop by hand until I heard it click. I turned it again until I heard it click a second time just for good measure. I then got back in the plane and it fired right up like normal. When I stopped for fuel at Zephyrhills on the way home, the engine started right up with out having to do the prop trick. I figured I would monitor it and if it acted up again to call in my A&P for a surgical procedure, but after thinking about it this morning I thought I would come to the forum here and see what others have to say. This owner’s approach was clearly to do nothing about the SDA slippage until it becomes so bad that he simply cannot tolerate it any more. This is truly a “penny wise, pound foolish” attitude because every time a Continental SDA slips, it “makes metal” inside the engine. If the owner is lucky, most of that metal will be caught by the oil filter and won’t circulate through the engine and contaminate the bearings and plug up the small passages in the hydraulic valve lifters. If he’s not so lucky, he could find himself buying a $30,000 engine overhaul. Yet this owner is hardly alone. 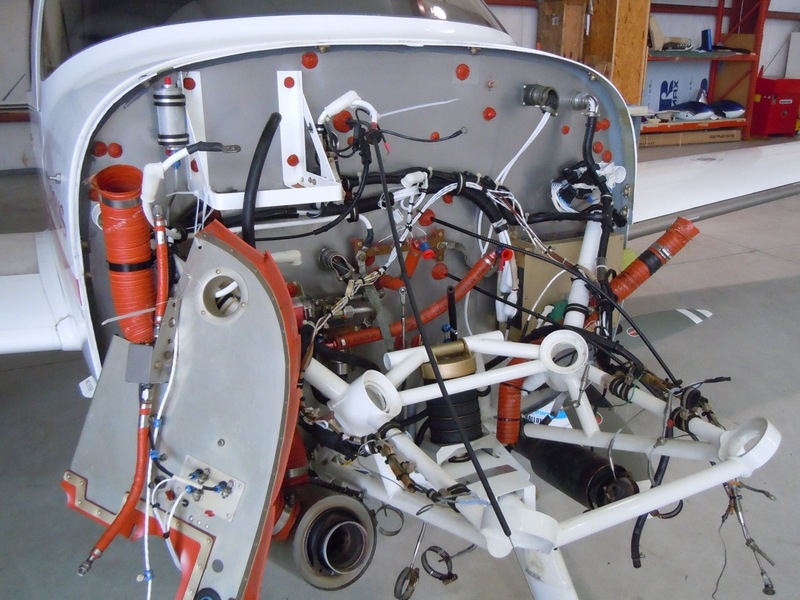 Countless owners of Continental-powered aircraft have slipping SDAs, but elect to live with the problem until it gets completely intolerable, rather than fix it. That’s not smart. I could go on and on, but I’m sure you’ve got the idea. Any time you become aware of something on your aircraft that isn’t quite right, the smart thing to do is to bring it to the attention of your mechanic pronto. If the mechanic agrees that the problem is one you can prudently defer fixing until the next scheduled maintenance cycle, fine. But it’s often the case that the fix-or-defer decision is a “pay me a little now or pay me a lot later” proposition. An exhaust leak at an exhaust riser flange might be solved with a simple gasket if addressed early. 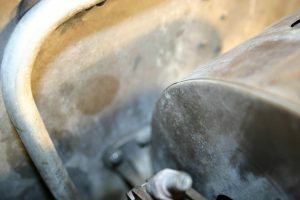 If left unaddressed until the cylinder exhaust flange has been severely eroded, the jug will probably have to come off for expensive rework or replacement. 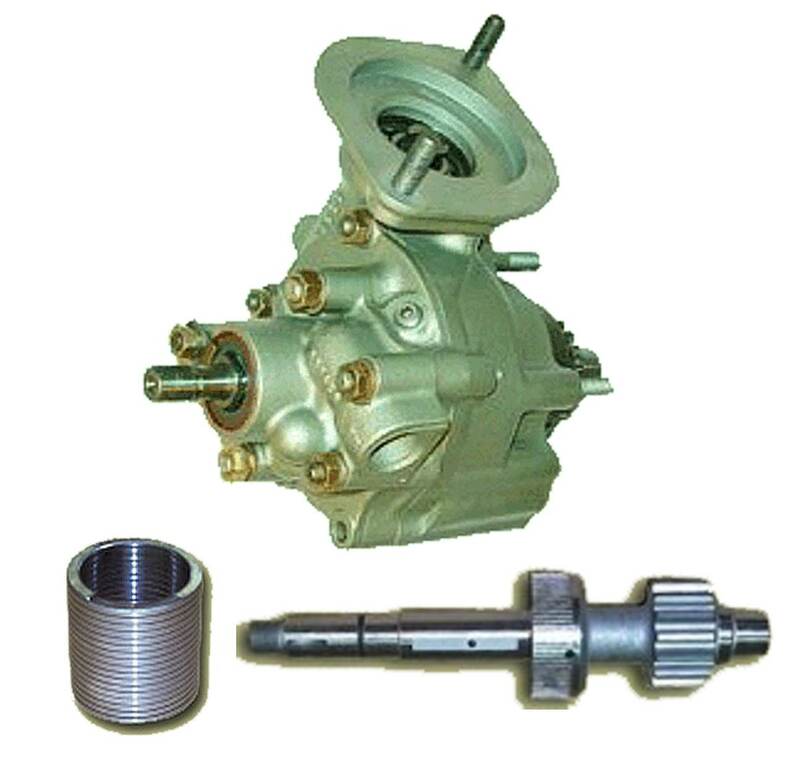 A slipping Continental starter drive adapter if caught early can usually be fixed for several hundred dollars or so by installing an undersize spring. If allowed to continue slipping until the shaftgear is worn beyond limits, you’re looking at thousands of dollars to repair—or if you get unlucky, a new engine. A fuel leak caught early can often be fixed by tightening a B-nut or replacing a chafed line. If ignored, it can cause a fire, loss of the aircraft, and perhaps even loss of life. So, don’t just scribble the discrepancy on a post-it note so you can squawk it at the next annual inspection. Fix it now—or at least discuss it with your mechanic before making a fix-or-defer decision. That’s the smart thing to do. September 4, 2018 / Mike Busch / Comments Off on Benevolent or predatory? My 1976 C182P is in for its annual inspection. 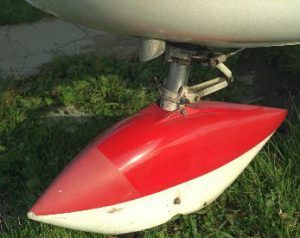 The mechanic removed the propeller and spinner bulkhead. (I didn’t know this was part of the usual annual routine, and I don’t think it’s been done before.) The mechanic advised me that he found tiny hairline cracks (they looked to me like tiny scratches) on the spinner bulkhead around some of the bolt holes. How serious is this? Coincidentally, the mechanic said he “just happened” to have used serviceable bulkhead of the same kind that he’d sell me for $1,500. I found this disturbing on so many levels. What possessed this mechanic to pull the propeller in the first place? I’ve never seen an annual inspection checklist that called for propeller removal. The normal procedure is to remove only the spinner dome and then inspect the propeller hub and spinner bulkhead while mounted on the aircraft. The mechanic had no business removing the propeller without an awfully good reason, and even with such a reason he shouldn’t have done it without first obtaining the aircraft owner’s permission. Then there’s the matter of the alleged “cracks” that the mechanic found in the spinner bulkhead. The owner indicated that they didn’t look like cracks, just tiny scratches. There’s no indication that the mechanic performed a dye penetrant inspection to determine whether the alleged “cracks” had any appreciable depth, or whether they were superficial scratches of no real significance. Finally there’s the issue of the used bulkhead the mechanic “just happened” to have on the shelf and offered to sell the owner for $1,500. 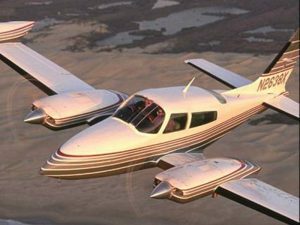 If the owner really needed one of these, then $1,500 might be a bargain price, since Cessna wants nearly $5,000 for a new one (I kid you not). On the other hand, if the existing bulkhead exhibited nothing more than the “tiny scratches” described by the owner, it would be crazy to replace it for $1,500. If they were indeed scratches and not cracks, then no action would be necessary or appropriate. If they were actual cracks, they could very likely be weld-repaired by a company like K&K Precision Welding in Troy, Wisconsin that is FAA-certified to do such repairs. Indeed, that’s the threshold question. To find out, I decided to consult with a colleague who is an A&P/IA, owns a nationally known maintenance shop that specializes in repairing single-engine Cessnas, and who “just happens” to own a Cessna 182 himself. Who could be more qualified to assess whether this mechanic was being benevolent or predatory? I emailed my colleague the Skylane owner’s query and asked for his reaction. His response was too good not to share. This would be funny if it weren’t so sad. This is one of those stupid mechanic tricks that make the rest of us look bad. These bulkheads are a well-known common problem area, but one with no known safety-of-flight risk. Worst case, the spinner departs the airplane. When this happened to me, I didn’t even realized it happened until I noticed it on the post-flight walk-around. In my opinion, this mechanic is taking advantage of the Skylane owner. The owner should absolutely refuse to pay for the removal and reinstallation of the propeller, which shouldn’t have been done in the first place. The owner should demand a dye penetrant inspection of the original spinner bulkhead, performed while he is present to watch. If cracks are confirmed by dye penetrant, then the owner should get on Google and research his options for getting his bulkhead repaired or finding a replacement elsewhere (eBay is a good place to start). If he must purchase the one from this mechanic , then he should negotiate the price to something no greater than the least expensive alternative his research came up with. Others might say that the mechanic made a “great catch” and did the owner a favor. In my view, however, the mechanic performed exploratory surgery without the owner’s authorization and for no valid reason. If the bulkhead was actually cracked but the cracks hadn’t yet progressed past the edge of the mounting hardware (and therefore not visible without removing the prop), then they didn’t constitute a safety issue. Even in the very unlikely event that a hidden crack suddenly propagated to the point of bulkhead failure, the resulting damage would be minimal. Cracks found in the normal course of an annual inspection must be addressed, but there’s certainly no need to take heroic efforts to find them…like pulling the prop. My best guess is that the mechanic wanted to dispose of the spinner bulkhead he had on the shelf, and decided this owner might make a good mark. I hope he doesn’t get away with it. It’s not uncommon for mechanics to take over-the-top maintenance actions that have adverse consequences for aircraft owners’ wallets. But in my experience, these arise mostly out of mechanics’ fear of being sued if something goes wrong, and rarely out of greed. This one might be an exception. What do you think? June 28, 2018 / Mike Busch / Comments Off on What Are The Odds? I just returned from a 5,300-nm cross-country flight in my Cessna 310. I love trips like this. It’s one thing to FLY an airplane for fun or sport, and quite another to USE an airplane as a serious traveling machine. I’ve always been a USER, and typically fly at least one transcontinental trip per year, and sometimes two or three. This was the first of three such trips that my partner Nona and I had planned for 2018. Our itinerary first took us from our home base in California to West Virginia to attend and speak at the Flying Physician’s Association annual meeting at The Greenbrier in White Sulphur Spings, West Virginia. Next stop was Rhode Island, where we spent a lovely week of sightseeing in the beautiful Ocean State. Then we headed westward to Montana, where I met up with my colleague Paul New to teach an all-day owner maintenance course at the AOPA Regional Fly-In in Missoula, Montana. Finally, after two-and-a-half weeks on the road, we returned home flying a somewhat circuitous route via Medford, Oregon, to avoid an area of convective weather developing in Nevada. What a fabulous trip. This was Nona’s first long cross-country via GA. Most of her previous flights with me lasted an hour or two at the most. She was predictably a bit apprehensive about making a trip of this magnitude in a small plane, so I decided to plan the trip in a way that would hopefully minimize her stress level and physiological discomfort. 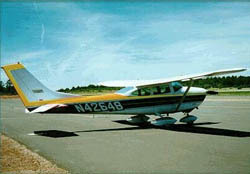 I vowed to break up the trip into legs of no more than three hours duration (instead of the four- and five-hour legs I often fly when I’m solo), and to choose a route where the minimum IFR altitudes were no higher than 13,000 feet so Nona wouldn’t have to deal with supplemental oxygen (instead of crossing the Rockies in the low Flight Levels as I often do when I’m solo). About two hours into the three-hour flight to Show Low, I heard Nona asking me over the plane’s intercom, “What this?” I glanced over and saw her pointing at the vacuum gauge on the extreme righthand edge of the instrument panel. One of the two red balls had popped out, signifying that one of the airplane’s vacuum pumps had failed. The other pump was working fine, and the vacuum reading remained at 5 in. hg., right in the middle of the green arc. 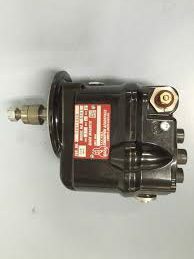 I explained this to Nona, quickly adding that there was nothing to worry about because the airplane has dual vacuum pumps—one mounted to each engine—so the loss of one vacuum pump was only a minor annoyance, and something I’d experienced quite a few times during the 31 years I’d owned the Cessna 310. I further explained that because these vacuum pumps always seem to fail during long trips, I always carry a spare pump in my wing locker, together with all the tools necessary to remove the failed pump and install the spare. I figured we’d do this at some convenient point during the trip, perhaps during our vacation week in Rhode Island. Nona seemed slightly shaken by the pump failure but reassured by my explanation. Fifteen minutes passed. The GPS showed us less than 30 minutes out from SOW. Then Nona called my name over the intercom and once again pointed to the vacuum gauge. I looked at the gauge. Now both red balls were popped out and the needle read zero. I’d experienced a double vacuum pump failure! What are the odds? I’d never before experienced the loss of both vacuum pumps during one trip, much less one leg. I believed the odds of this happening were close to infinitesimal. But it happened. Apparently, the Laws of Probability had been trumped by Murphy’s Law. I quickly sized up the situation. With no vacuum, the vacuum-driven attitude gyro would quickly spin down, roll over, and play dead. The attitude-based 400B autopilot would dutifully follow the dying attitude gyro and put the airplane into a graveyard spiral unless I disengaged the autopilot and hand-flew the airplane—which I promptly did. No big deal, since Show Low was now just minutes away and the weather was typical for Arizona: severe clear and windy. However, the consequences for the rest of the trip were dire. My personal minimums say that a non-functioning autopilot is a no-go item for flights exceeding one hour. Furthermore, I was flying a VFR-only airplane on a trip where significant instrument weather was forecast in the eastern half of the country. Continuing the trip without pneumatics was infeasible. But canceling the trip was unthinkable. So clearly, I was going to have to replace one of the failed pumps at Show Low before launching for Wichita and points east. The landing at SOW was turbulent. The surface winds were gusting to 25 knots. We parked the airplane close to the fuel trucks, went inside to place a fuel order, eat some lunch, and use the facilities (not necessarily in that order). I asked the fueler if there was a maintenance shop on the field. He said no. I asked if there was some kind of maintenance hangar I could use for an hour or two. He said there wasn’t. I quickly concluded that I’d have to replace the pump myself on the tarmac in a howling 25-knot wind. Are we having fun yet? I asked Nona if she was willing to help me, and warned that she would probably get her hands dirty. She was game. I pulled my traveling toolkit out of my wing locker and borrowed a small stepladder from the fueler. Nona and I gingerly removed the top cowling of the left engine, making sure the wind wouldn’t catch it and wrest it from our grasp. We carefully set the cowling on the tarmac under the wing, hoping it would stay put while we worked on the pump. The pump transplant itself took us about three hours, twice as long as normal. We were working under battlefield conditions, the wind whistling in our faces, the sun in our eyes. Finally, with the sun low in the southwestern sky, we finished the job, secured the cowling, and started the left engine for the “smoke test” of the newly installed pump. It worked. The left red ball was sucked in, the vacuum gauge needle moved to the middle of the green, and the attitude gyro erected normally. We were back in business, albeit one pump shy of a full load. It was enough. I couldn’t help but think how lucky I was. I was an A&P. I carried a spare pump. I had all the necessary tools to install it. Had any of those three things not been true, I’d have been in a real pickle and the whole trip might have been in serious jeopardy. We took off for Wichita nearly four hours behind schedule. As a result, what was planned as a daytime flight wound up being a nighttime flight. That spooked Nona a little, as she’d never flown at night before, and much of the flight was over desolate terrain with very few lights to provide a visual reference. She was very relieved when we touched down at Wichita’s Dwight D. Eisenhower National Airport, were marshalled into the Signature Flight Support ramp, and quickly whisked to the DoubleTree by Hilton on the airport. 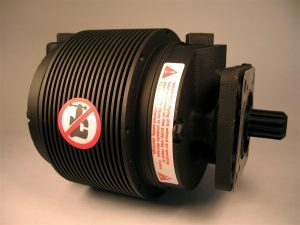 First thing the next morning, I went online and ordered two vacuum pumps from Aircraft Spruce, to be shipped from their Atlanta warehouse to The Greenbrier. One pump would be used to replace the still-failed pump on the right engine, while the other would become my new spare. We flew our next three-hour leg to Lexington, Kentucky, in IMC conditions, rented a car, toured around the beautiful bluegrass horse country, and stayed overnight. The next morning we made the short but seriously IMC flight to Greenbrier Valley Airport. The vacuum pumps from Aircraft Spruce arrived during our Greenbrier stay. We considered installing one of the pumps on the right engine before departing West Virginia, but ultimately decided to defer that until we got to Rhode Island. Nona and I also performed the second pump transplant on the tarmac at Quonset State Airport, but there wasn’t much wind and we got the job done in about one hour flat. Nona proved to be a terrific mechanic’s helper, handing me exactly the right part in exactly the right order like a top-notch surgical nurse. The remainder of the trip to Montana and California went off without a hitch. After returning home, I researched my maintenance logs to find out when the previous vacuum pumps were installed and how long they lasted before failing. Turns out the left pump lasted for 8 years and 700 hours, while the right pump lasted for 9 years and 800 hours. Is Your Equipment List Up-To-Date? May 22, 2018 / Mike Busch / Comments Off on Is Your Equipment List Up-To-Date? A funny thing happened as I was finishing up the annual inspection on my 1979 Cessna T310R back in March of 2000. The inspection was complete, and I gotten off pretty light. My IA didn’t find all that much wrong with the airplane. (This was years before I became an IA myself.) What discrepancies had been found were now all resolved. The airplane was finally back together and all closed up. The AD research was done. All that was left was the paperwork. One of the few discrepancies had been an ELT that flunked its annual FAR 91.207(d) test—the [email protected]#$%* thing wouldn’t go off no matter how hard I whacked it—so I had yanked it out and installed a shiny new TSO-C91A unit, complete with a panel-mounted switch/annunciator module. I asked my IA whether or not a weight-and-balance revision would be necessary. It turned out that the new ELT weighed almost precisely the same as the old one, and the panel module weighed next to nothing, so the IA determined the W&B change would be negligible. “What equipment list?” I replied innocently. I instantly sensed from the IA’s expression that this was not the answer he wanted to hear. “Your POH or W&B Report is required to include an up-to-date equipment list, said the IA, giving me his best do-I-have-to-explain-everything scowl. “That list must be revised whenever equipment is added or removed,” he added. I retrieved the POH from the airplane and flipped to the back of the W&B chapter. Sure enough, there was an equipment list. I showed it to my IA. He shook his head. Sure enough, the equipment list in the POH had a column titled “Mark If Installed,” but that column was completely blank. There was no indication of what equipment was actually installed in my airplane. I returned to the airplane and rummaged through my W&B documentation, finally coming up with what I was looking for. It was a yellowed and somewhat dog-eared computer printout on sprocket-fed fan-fold paper—the kind that was used back in 1979—that listed the equipment installed in my particular aircraft when it left the Cessna factory, complete with the weight and arm of each item. The only problem was that this printout hadn’t been revised since the day Cessna generated it in 1979, despite the fact that by now almost all the original factory-installed avionics had been replaced with newer stuff. Sigh. 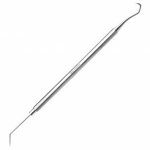 An equipment list is furnished with the aircraft which specifies all the required equipment, and all equipment approved for installation in the aircraft. The weight and arm of each item is included on the list, and all equipment installed when the aircraft left the factory is checked. When an Aircraft Maintenance Technician adds or removes any item on the equipment list, he or she must change the weight and balance record to indicate the new empty weight and empty-weight CG, and the equipment list is revised to show which equipment is actually installed. That idea appealed to me. It would be straightforward to enter all the equipment into an Excel spreadsheet. 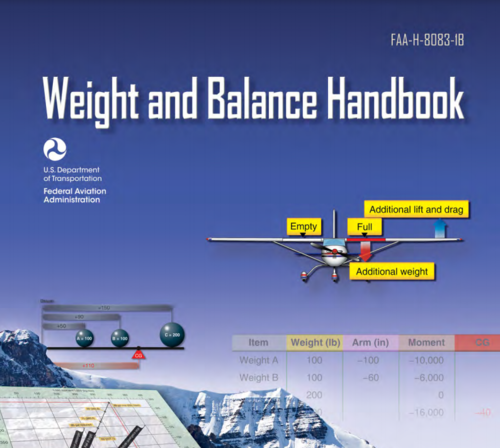 In fact, it quickly occurred to me that if the spreadsheet included weight and arm for each item (as Cessna’s original did), it would be easy to have the spreadsheet calculate the aircraft empty weight and CG. Then, when equipment was added or removed in the future, simply entering that information into the equipment list spreadsheet would automatically produce an updated W&B. The more I thought about it, the more I became convinced this was the way to go. 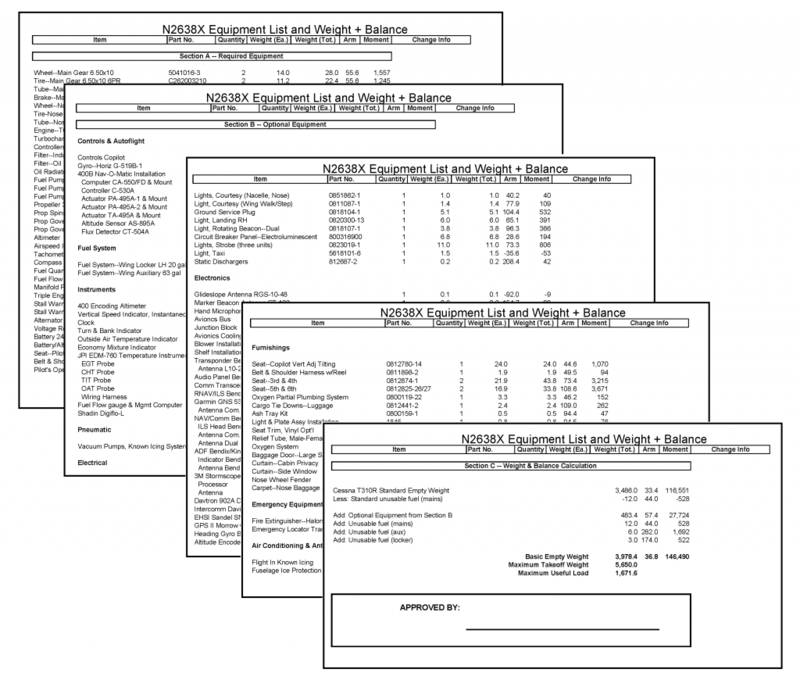 Finally, I added a third section to the spreadsheet—Section C—in which I entered the necessary formulas to add up the weights and moments for each item in Section B, add it to the standard empty aircraft weight (the weight of a fictitious aircraft with only required equipment), and calculate the actual empty weight and CG of my aircraft. The whole project took about two hours, and the result was a very nice-looking and up-to-date equipment list. In the course of making up this spreadsheet, I discovered a few interesting things. The first was that a few of the items of equipment that Cessna listed on its computer printout had never (so far as I could tell) actually been installed in the aircraft. One such item was “Handset & Boom Mic., Combination” (0.4 lbs. 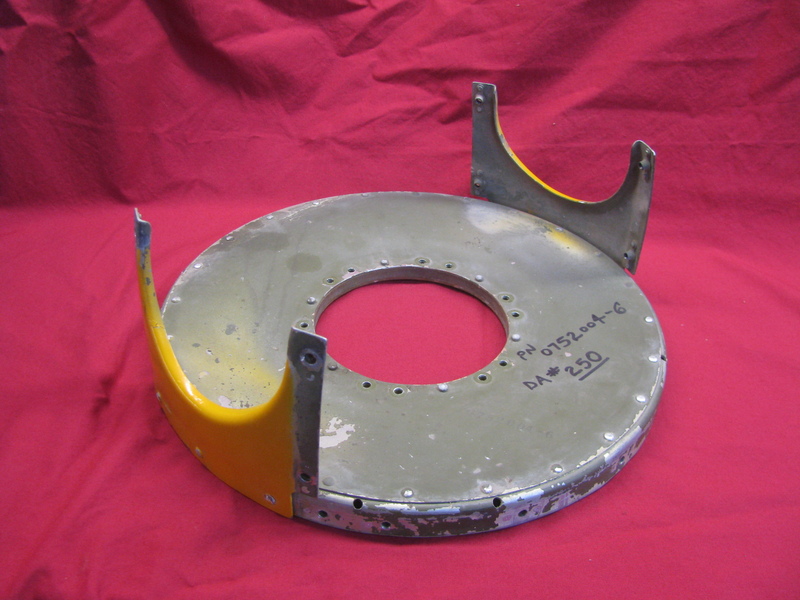 ), and another was “Approach Plate Holders” (0.2 lbs.). No big deal. Of somewhat greater significance, I found that certain items on the original Cessna equipment list had been removed from the aircraft, but apparently the removals were never recorded in W&B amendments. 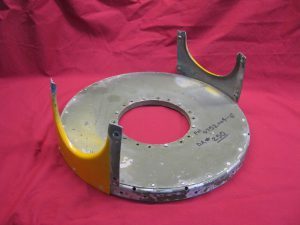 For example, when the original Cessna 400 transponder was removed almost immediately after I bought the aircraft and was replaced with a King KT-76A; the old transponder was backed out of the W&B, but its mounting tray (0.6 lbs.) was forgotten. The bottom line is that when the dust settled, I’d picked up a few extra pounds of empty weight for my trouble. After double-checking everything carefully to make sure I’d made no errors, I presented my handiwork to the IA, who triple-checked it and then affixed his signature and A&P/IA certificate number, thereby making it an official part of my Airplane Flight Manual and Weight & Balance Report in the eyes of the FAA. I’m glad I went through this exercise, although I’m embarrassed that it took me more than a decade to discover that “my papers were not in order.” Perhaps I was the only aircraft owner out there blissfully flying around without an up-to-date equipment list, but somehow I doubt it. Since that time, I became an IA myself and have made quite a few equipment changes to the aircraft. Having the computerized equipment list and automatic W&B calculation has repaid that two-hour effort many times over. Next time you’re pre-flighting your airplane, you might just want to grab your POH and W&B papers and eyeball the equipment list to make sure it has been kept up to date. If it hasn’t, you might just want to do something about it before the next annual…or ramp check. 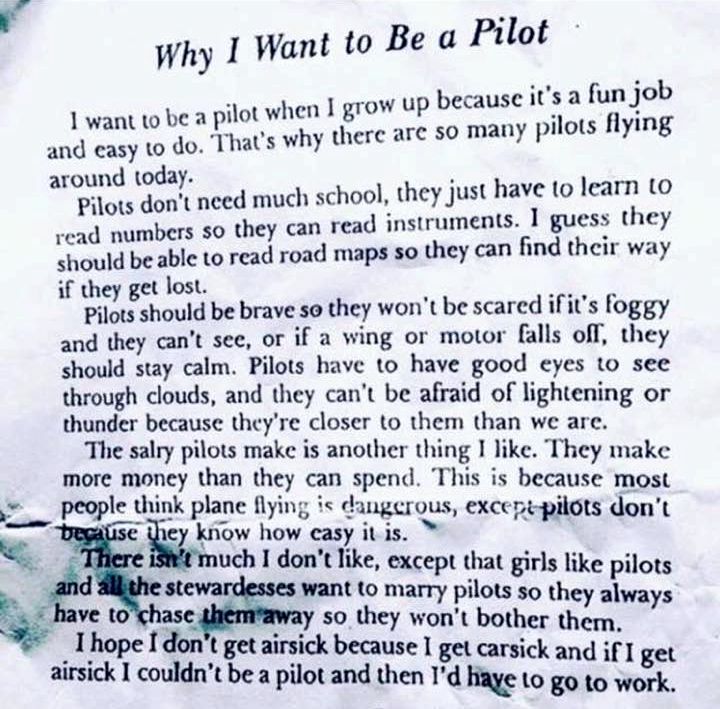 I fell in love with flying more than 50 years ago. I had just graduated with a degree in mathematics from Dartmouth College, and had a summer job in Phoenix, Arizona, prior to starting work on my Ph.D. at Princeton University. 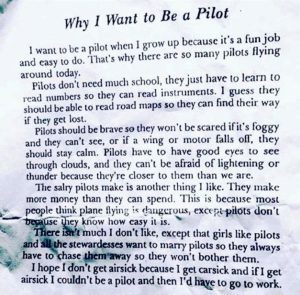 As a kid, my dad introduced me to free-flight model airplanes, in high school I toyed with piston-powered control-line models, and I had occasional fantasies about flying real airplanes. So, when I found myself in Phoenix that summer where the weather is CAVU about 360 days per year, I figured it would be a great time to learn to fly. I drove to Phoenix Sky Harbor Airport one afternoon, walked into the offices of Sawyer Aviation, and signed up for my first introductory flight in a 1959 straight-tail no-rear-window Cessna 150. I was hooked and never looked back. When the summer was over, the ink still wet on my private pilot certificate, I joined the Princeton Flying Club and started flying rental airplanes. Over the next few years, I earned my commercial and instrument rating and flew all over the eastern United States. After a few years of graduate studies at Princeton and Columbia, I moved to California to start my first full-time job as a computer scientist with a Fortune 500 company headquartered just south of LAX. That’s when I bought my first airplane. Fast forward about 25 years. By now I’d left the Fortune 500 world to start my own software company. I’d sold the Skylane (which I’m pleased to see remains on the active FAA registry), bought a 1972 Bellanca Super Viking, sold that, married a gorgeous blonde named Jan, bought my first house, sold that, moved from L.A. to a semi-rural part of California’s central coast, bought a house there, and ultimately bought my third airplane, a 1979 Cessna Turbo 310 that I’ve owned, flown, and maintained for more than 30 years and 4,000 hours and still am flying today. The Cessna 310 and I found ourselves in Tulsa, Oklahoma, one day. I was en route from California to the East Coast and decided to stop in Tulsa to visit with my wife’s brother and sister-in-law. It was then that I met their 10-year-old son Justin, who seemed like a great kid, but his life seemed to lack focus. I learned he had a history of running with the wrong crowd and repetitively getting himself into hot water. On impulse, I offered to take Justin up in the 310 for his first ride in a general aviation airplane. Little did I know what an impression that would make on him, and what impact it would have on his life trajectory. Fast forward another 10 years. Justin was a senior at Oklahoma State University in Stillwater, Oklahoma. He’d joined the OSU flying club, earned his private, commercial, and instrument tickets, and was working on his CFI. He was engaged to Carrie Beth, a gorgeous blonde he’d met at OSU, and had decided to apply to the airlines after graduation for work as a professional pilot. He was hired by regional carrier Great Lakes Airlines as a first officer flying Beechcraft 1900Ds. Justin and I occasionally kept in touch by email. From time to time over the next 10 years, we’d hear one another on Center frequency when his Beech Airliner and my Cessna 310 happened to wind up in the same sector at the same time…and we’d say “hi” to one another on frequency, violating AIM communication protocol. 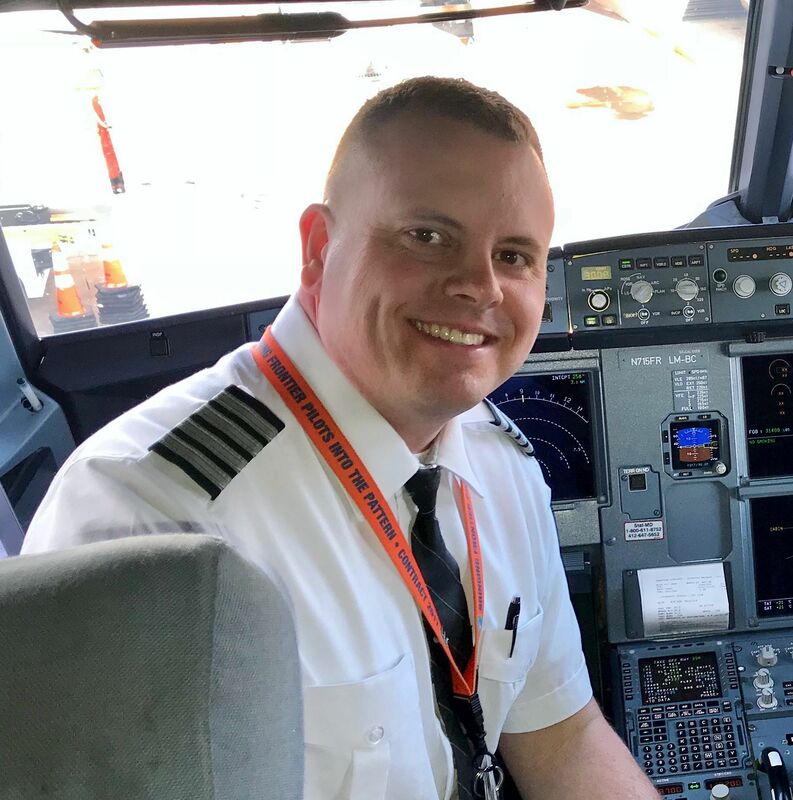 Justin accumulated hours and seniority at Great Lakes, working his way up to captain and check airman, then applied to and was hired by Frontier Airlines as a first officer on the Airbus 320. Now he was spending most of his time above FL300 and we seldom heard one another on frequency. Carrie had become a senior manager at Anheuser-Busch and took a promotion that caused her and Justin to relocate from Denver to St. Louis. They had a son that they named Ethan, and another one that they named Jacob. By now I hardly heard from them at all, much to my regret. 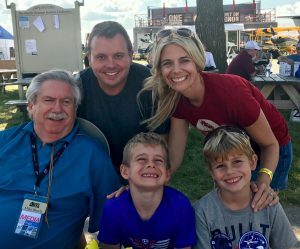 Last summer, Justin reached out to me quite unexpectedly to let me know that he, Carrie, and the two boys were planning to attend AirVenture 2017 at Oshkosh—something Justin had been promising me he’d do for decades but never happened. At first, my attitude was “I’ll believe it when I see it,” but soon my anticipation grew. I was now nearly 73 years old, hadn’t seen Justin or Carrie Beth for more than a decade, and had never met their sons. When we finally rendezvoused near Aeroshell Plaza, I was thrilled. 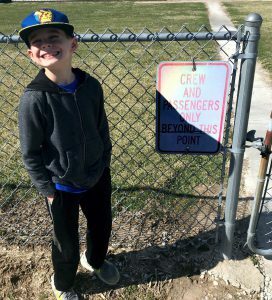 The boys—now ages eight and six—glommed onto me as if I was their long lost uncle (which I guess I was), and we went whizzing around the AirVenture campus on my golf cart with big grins on all our faces. 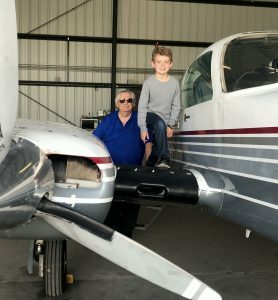 Ethan, the eight-year-old, was especially vocal about wanting to become a pilot when he grew up. As things wound down at AirVenture, I asked Justin and Carrie whether there was any possibility of them and the kids coming to visit me in California. They said they’d love to but couldn’t commit to a date because Justin was on the verge of upgrading from first officer to captain at Frontier and couldn’t yet predict his schedule. They looked at the boys’ school schedule and told me that if everything went without a hitch, they might be able to visit during Easter break. Last March, after much grilling and torture in the Airbus simulator, Justin succeeded in making captain. I learned of this when he texted me a photo of his new four-stripe shirt. Not long afterward, he texted me a photo showing him in the left seat of the Airbus with check airman Kelli Cammack in the right seat, overseeing his Initial Operating Experience (IOE) trip as Captain. I’m so damn proud of Justin! You probably already see where this is going. Justin, Carrie, and the boys did indeed come to visit me in California over Easter break. The April weather was glorious. The family walked on the beach, took part in an Easter egg hunt, even visited some local wineries to do some tasting. 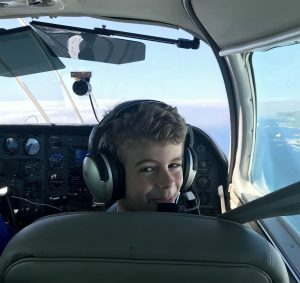 Then on Easter Sunday, we had a religious experience: Ethan, his dad, and I drove to the airport at Santa Maria to go flying in my Cessna 310—the same 310 in which Justin had been bitten by the flying bug—to give eight-year-old Ethan his first ride in a GA airplane. Captain Justin climbed into the back seat and declared himself the official photographer. I took the left front seat and Ethan the right. Even with the seat cranked up to maximum height and slid to the forward stop, Ethan could barely see over the glareshield and his feet came nowhere near the rudder pedals, but that didn’t seem to bother him a bit. 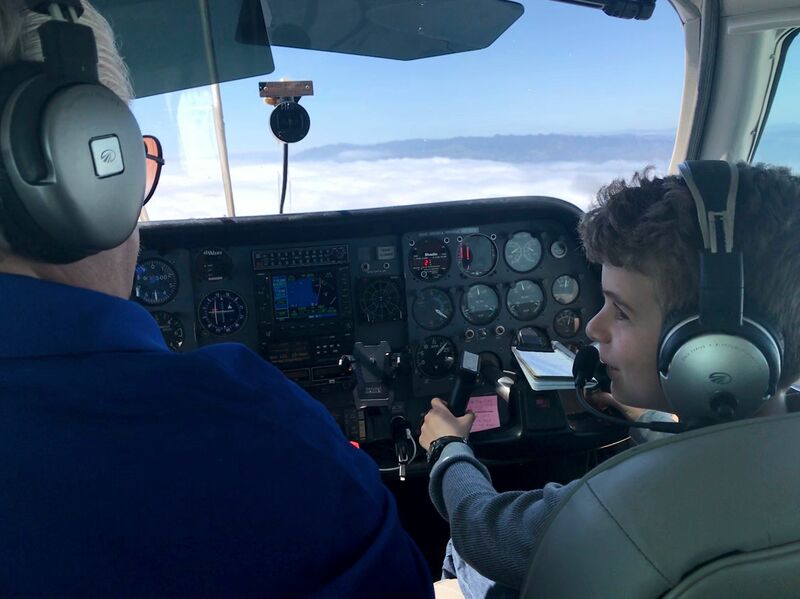 Ethan predictably overcontrolled a bit at first, but with a constant stream of voice coaching he managed to keep his altitude within 200 feet and his heading within 30 degrees. Within minutes, his performance improved to the point that he was holding within 100 feet and 10 degrees—that’s private pilot checkride standards, folks—and mind you he was flying a 5,600-pound twin, not a Cessna 150. The kid clearly had an aptitude. I was jealous. Justin was delighted. I programmed the GNS 530 for a route up the coast to Big Sur, then east to King City, then back down the inland route to Santa Maria. I showed Ethan how to keep the little airplane symbol on the magenta course line on the 530’s moving map, and he caught on instantly (it was just like Waze). Approaching Big Sur, we climbed from 1,200 feet to 7,500 feet to cross the mountain range, then descended to 5,500 feet for the inland return leg. Approaching Santa Maria, I talked Ethan through a descent to pattern altitude, then took back the controls on downwind leg. By the time we shut down the engines, climbed out of the cabin, and pushed the plane back into my hangar, it was pretty obvious that Ethan had been bitten by the flying bug big time. I was teary eyed the next day as the clan drove off in their rental car, headed for San Francisco and then home to St. Louis. 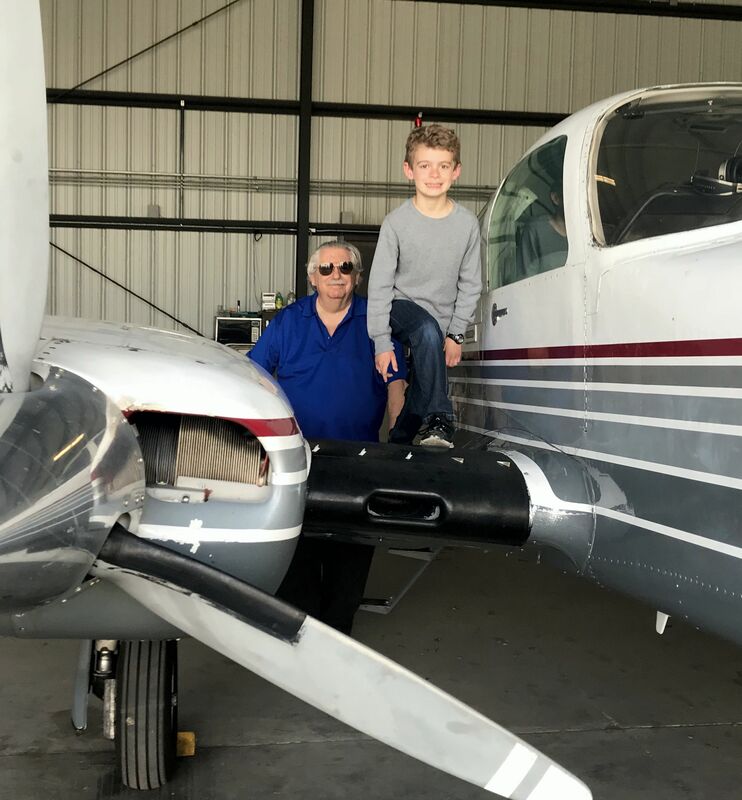 Justin is now seriously committed to buying his first GA airplane—very likely a Cessna 182, following in his uncle’s footsteps—so he can take the kids flying on a regular basis. The family has already made their campsite reservations for AirVenture 2018, and I’m looking forward to seeing them there in July. 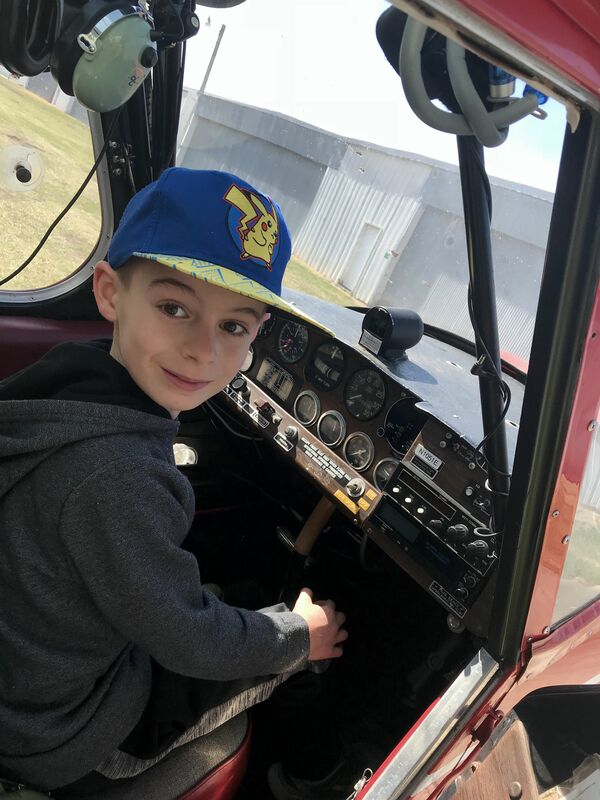 Now if I can keep flying until I’m 90, maybe I’ll be able to catch First Officer Ethan on Center frequency. Would that be cool, or what? If you fly a piston-powered aircraft, you undoubtedly were taught to perform a “mag check” during the pre-takeoff runup. But do you know how to do it correctly, what to look for, and how to interpret the results? Surprisingly, many pilots don’t. To begin with, most POHs instruct you to note the RPM drop when you switch from both mags to just one, and give some maximum acceptable drop. In my view, this archaic procedure makes little sense for aircraft that are equipped with a digital engine monitor (as most are these days). EGT rise is a far better indicator of proper ignition performance than RPM drop. Watching EGT on the engine monitor during the pre-flight mag check tells you exactly which spark plug and cylinder is having a problem. 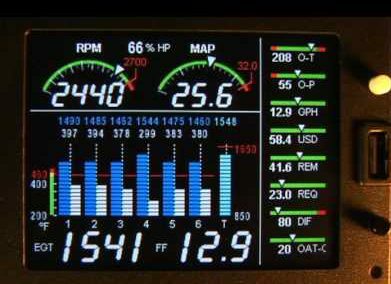 So my advice is to focus primarily on the engine monitor, not the tachometer, when performing the mag check. What you should be looking for is all EGT bars rising and none falling when you switch from both mags to one mag. The EGT rise will typically be 50 to 100 degrees F, but the exact amount of rise is not critical. 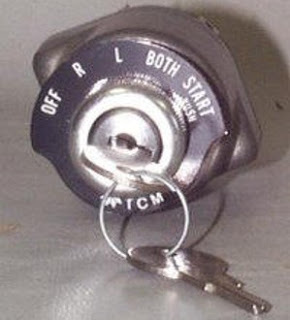 It’s perfectly normal for the rise to be a bit different for odd- and even-numbered cylinders. You should also be looking for smooth engine operation and stable EGT values when operating on each magneto individually. A falling or erratic EGT bar or rough engine constitutes a “bad mag check” and warrants further troubleshooting of the ignition system before flying. Bad mag or bad plug? 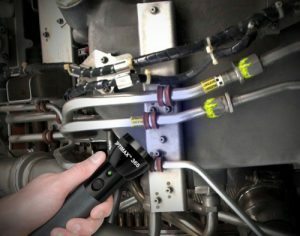 The “mag check” is poorly named, because because the vast majority of “bad mag checks” are caused by spark plug problems, not magneto problems. We really should be calling it an “ignition system check” but the “mag check” terminology is deeply entrenched in pilot lingo, so I’m not going to try to fight that battle. How can you tell if the culprit is the plugs or the mags? Simple: A faulty spark plug affects only one cylinder (and one EGT bar on your engine monitor), while a faulty magneto affects all cylinders (and all EGT bars). If you get an excessive RPM drop when you switch to one mag, but the EGTs all rise and the engine runs smooth, chances are that it’s not a bad mag but rather retarded ignition timing. This is often caused by mechanic error in timing the mags during maintenance, although it is possible for ignition timing to drift out of spec due to cam follower wear or some other internal magneto issue. Retarded ignition timing also results in higher-than-usual EGT indications. Conversely, advanced ignition timing results in lower-than-usual EGT indications, and also higher-than-usual CHT indications. Advanced timing is a much more serious condition because it can lead to detonation, pre-ignition, and serious engine damage. If you observe low EGTs and high CHTs after an aircraft comes out of maintenance, do not fly until you’ve had the ignition timing re-checked. Advanced timing is easily detected with an engine monitor, but you won’t be able to detect it if you’re just looking for RPM drop. The usual pre-flight mag check is a relatively non-demanding test, and will only detect gross defects in the ignition system. To make sure your engine’s ignition is in tip-top shape, I strongly recommend performing an in-flight mag check every few flights. The in-flight mag check is performed at normal cruise power and normal lean mixture (preferably LOP). Run the engine on each individual mag for at least 15 or 20 seconds. 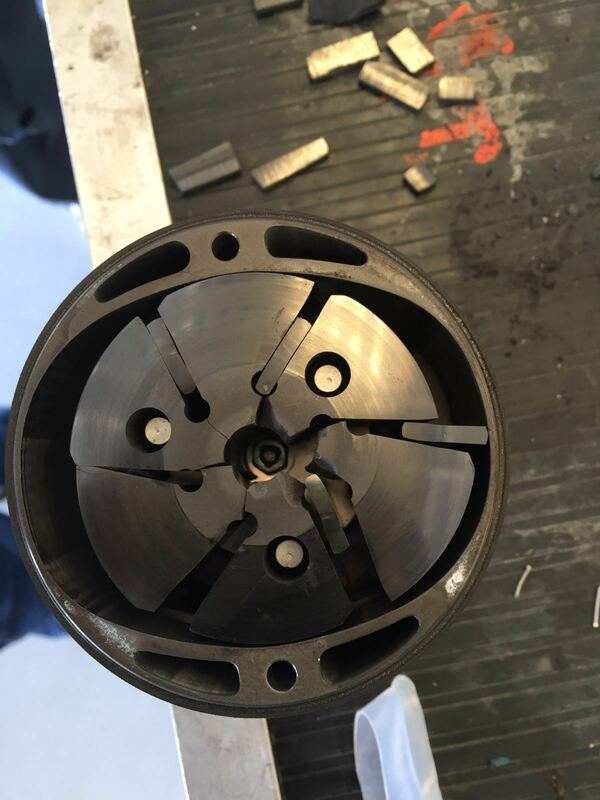 Ensure that all EGTs rise, that they are stable, and that the engine runs smoothly on each mag individually. If you see a falling or unstable EGT, write down which cylinder and which mag, otherwise you’ll probably forget which plug is the culprit by the time you land. Because a lean mixture is much harder to ignite than a rich one, an in-flight LOP mag check is the most demanding and discriminating way to test your ignition system, and will expose subtle flaws and marginal ignition performance that are undetectable during the usual on-the-ground pre-flight mag check. It’s by far the best way to detect ignition system problems early, before they reach the point of delaying your departure or soiling your underwear. I just added ADS-B Out to my airplane. I’ve been looking forward to this moment for a very long time—48 years to be exact. 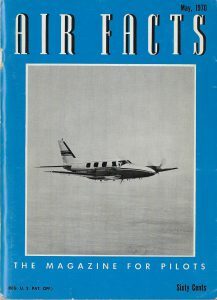 It was 48 years ago that my very first aviation article was published. Its title was “The Role of Computers in Air Traffic Control.” I was 26 years old at the time, not long out of college, and starting a career in computer software at the dawn of the computer age. I’d only been a pilot for five years and an aircraft owner for two. I timidly submitted the 3,000-word manuscript to Leighton Collins (1903-1995), the dean of general aviation journalists (and Richard Collins’ dad). Leighton founded his magazine Air Facts in 1938, the first GA magazine to focus primarily on safety. In the ‘50s and ‘60s, Leighton became a pioneer in using GA airplanes to fly IFR, something that was considered risky business at the time. In 1970, I was a newly-minted CFII and Skylane owner, and Leighton was my hero and Air Facts my bible. Leighton loved my article, and published it in the May 1970 issue of Air Facts. I was thrilled. I was also hooked and went on to write more than 500 published aviation articles between then and now. A pilot flying VFR in clear weather is unlikely to see more than a few other aircraft on a typical flight; to him the sky seems to be a rather empty place. Yet to the pilot stuck in an IFR hold with an estimated-further-clearance time forty-five minutes away, the sky seems to be an order of magnitude more crowded. Why? Clearly there is no shortage of airspace; every VFR pilot knows that. The aircraft flying under IFR have the best equipment and the most proficient pilots aboard. Where does the congestion come from? My conclusion was that the fundamental difference between VFR and IFR lies in who is separating aircraft. 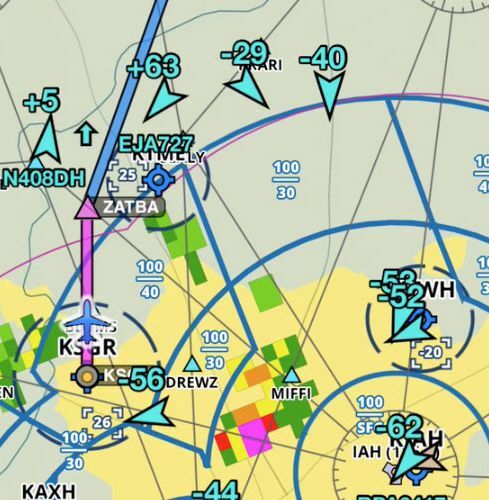 VFR pilots are responsible for their own separation, while IFR pilots rely on air traffic controllers to keep them separated from other traffic. Thus, I reasoned, the comparatively low capacity of the IFR system must be attributable to some failing on the part of controllers. 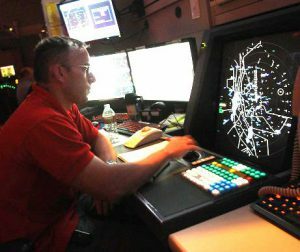 Yet as someone who has spent many hours visiting ATC facilities and observing controllers at work while plugged in beside them, I can testify that these folks are amazingly sharp, skilled, and well-trained professionals who do their jobs exceptionally well. A pilot is concerned solely with the one aircraft that he’s flying, but a controller must keep track of several aircraft at once. Give a person several things to do at once—even simple things like head-patting and tummy-rubbing—and his performance in each task drops sharply. Keeping track of a high-speed airplane is considerably harder than either head-patting or tummy rubbing. Keeping track of a dozen such airplanes travelling in random directions at random altitudes is simply beyond the capabilities of any human. Our IFR system is designed to simplify the controller’s job to the point that it is within the realm of human capability. It does this primarily by eliminating the amount of randomness the controller must deal with. It strings airplanes along a few well-defined airways/SIDs/STARs, confines them to a few standard altitudes, and sometimes slows them down to a few standard speeds. Doing these things makes the airplanes much easier for the controller to keep track of and keep separated, but it also wastes most of the available airspace and reduces the capacity of the system. Do we really need ATC? It seemed to me that the capacity of the IFR system could be vastly increased if we could just stop relying on controllers to separate airplanes and enable pilots to self-separate, much as they do when flying VFR. In 1970 when I wrote the article, we were right on the cusp of two major technological breakthroughs that I believed had the potential to make that possible. One of them was the promise of accurate satellite navigation. The Naval Research Laboratory had launched its Timation satellites in 1967 and 1969, the first ones to contain accurate atomic clocks suitable for navigation. Meantime, the Air Force’s Space and Missile System Organization was testing its more advanced system (codenamed Project 621B) for aircraft positioning between 1968 and 1971. These were the progenitors of today’s GPS system—something I could see coming in 1970, although a seriously underestimated how long it would take to become operational. 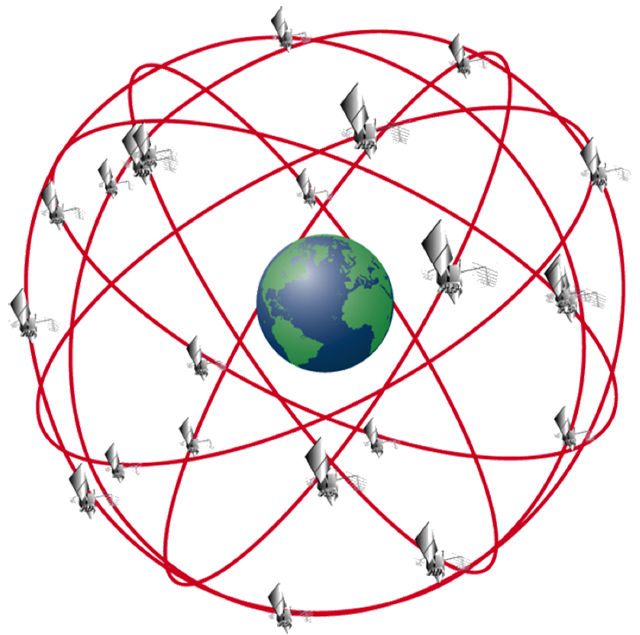 The first constellation of 10 “Block-I” GPS satellites wasn’t in orbit until 1985, and the system’s full operational capability wasn’t announced until 1995. The second breakthrough was large-scale integration (LSI)—the creation of integrated circuits containing tens of thousands of transistors on a single silicon chip—and the emergence of the microprocessor. 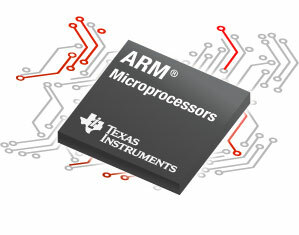 Microprocessors weren’t yet invented in 1970 when I wrote the article, but as a computer scientist (my day job at the time) I could see them coming, too. As it turned out, Intel introduced its 4004 microprocessor in 1971, its 8008 in 1972, and the 8080 (which really put microprocessors on the map) in 1974. This watershed development made it feasible to equip even small GA airplanes with serious computing power. In my 1970 Air Facts article, I painted a picture of the kind of ATC system these new technologies—GPS and microcomputers—would make possible. I postulated a system in which all IFR aircraft and most VFR aircraft were equipped with a miniaturized GPS receiver that continually calculated the aircraft’s precise position and a transmitter that broadcast the aircraft’s coordinates once per second. 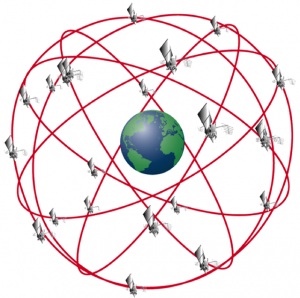 A network of ground stations would receive these digital position reports, pass them to ATC, and rebroadcast them to all aircraft in the vicinity. A microcomputer aboard each aircraft would receive these digital position reports, compare their coordinates with the position of the host aircraft, evaluate which aircraft are potential threats, and display the position, altitude and track of those threat aircraft on a cockpit display. Such a cockpit display would enable IFR pilots separate themselves from other aircraft, much as VFR pilots have always done. It would permit them to fly whatever random routes, altitudes and speeds they choose, giving them access to the same “big sky” that VFR pilots have always enjoyed. When I re-read that 1970 article today, it’s truly eerie just how closely the “ATC system of the future” I postulated then resembles the FAA’s “Next Generation Air Transportation System” (NextGen) that the FAA started working on in 2007 and plans to have fully operational in 2025. Key elements of NextGen include GPS navigation and ADS-B—almost precisely as I envisioned them in 1970. I was wildly overoptimistic in my prediction that such a system could be developed in as little as five years. If the FAA does succeed in getting NextGen fully operational by 2025, it will be the 55th anniversary of my Air Facts article. 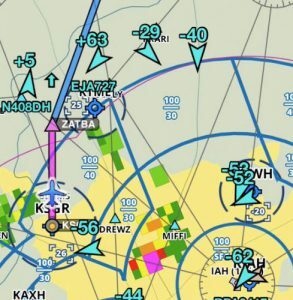 NextGen also includes improved pilot/controller communication (both textual and VOIP) and various improvements designed to allow use of more airspace and random routes. Sadly, it stops well short of transferring responsibility for separating IFR aircraft from ATC to pilots as I proposed in 1970—although our aircraft will have the necessary equipment to do that if the FAA would just let us. Maybe that’ll have to wait another five decades until NextNextGen is deployed (and there’s an autonomous self-piloting octocopter in every garage). Generally, aviators don’t like surprises. The good ones—like catching an unexpected 30-knot tailwind, or finding an ANR headset under the Christmas tree—are rare. The bad ones—like an inoperative self-serve fuel pump, a flat nosewheel strut, or worse-than-forecast weather at your destination—are more common. Some of the really bad surprises involve aircraft maintenance. Since my company manages the maintenance of about 1,000 GA airplanes, I thought I’d seen just about every sort of maintenance misfortune that can befall an aircraft owner, but the one I’m about to relate has to take some sort of prize. It involves the owner of a Cirrus SR22—I’ll call him Mark—who was starting to get a bit concerned about the increasing oil consumption of his Continental IO-550-N engine. He was starting to notice increased oil on the belly behind the righthand tailpipe, and a buildup of sooty deposits inside that tailpipe. A maintenance-involved owner and a pretty sharp cookie, Mark’s suspicion was that the oil consumption was probably the result of lead-contaminated oil control rings in the right-bank cylinders (#1, #3, and #5). 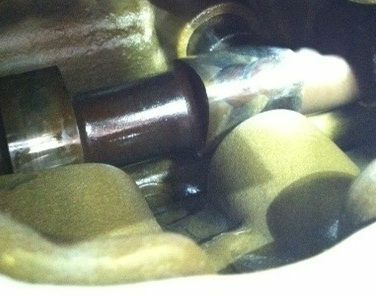 The presence of oily deposits on the #3 and #5 spark plugs seemed to confirm that theory. Mark flew his airplane to a well-known Cirrus Service Center for further evaluation. The shop’s Director of Maintenance (DOM)—I’ll call him Steve—told Mark that he’d do a thorough borescope examination of the cylinders once the engine had cooled, and report back on what he found. This low-resolution photo from the A&P wasn’t adequate to determine the condition of the cam. Needless to say, Mark was shocked. He had not given the shop permission to remove any cylinders. He’d only authorized a borescope inspection. 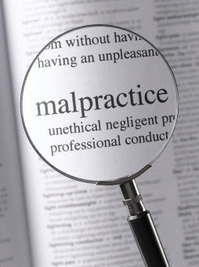 Furthermore, the metal contamination diagnosis made no sense to Mark, because shortly before he took his plane to the shop, he’d performed an oil change and cut open the oil filter and found it clean as a whistle. Something wasn’t adding up. Mark bit his tongue and replied to Steve’s email by asking where the shop proposed to send the engine for teardown, and indicating that Mark was going to investigate alternative engine shops. After studying SID05-1B carefully, Mark drove to the Service Center armed with a camera, an inspection light and a sharp dental pick, determined to carry out his own SID05-1B cam inspection and satisfy himself whether the condition of his cam truly warranted an engine teardown. Upon arriving at the shop, he made a beeline for the maintenance hangar. Mark was totally unprepared for what he saw when he entered the hangar: His SR22 had no engine or propeller! As he approached the airplane, he discovered his engine sitting on a wooden pallet on the floor of the hangar. Apparently, the shop’s mechanics had removed it from the airplane without obtaining his authorization, asking for his permission, or even notifying him of what they intended to do. Mark was floored. Cylinders #3 and #5 had been loosely reattached to the palleted engine in preparation for shipping it to the engine shop. Mark had one of the shop’s mechanics remove those cylinders so Mark could perform the cam inspection that he’d come there to do. 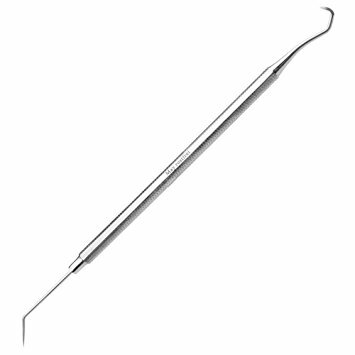 He dutifully ran the sharp dental pick over the surfaces of all the exposed cam lobes (per SID05-1B) and could not find a single crack, pit, or other feature deep enough to catch the tip of the pick. Mark took a bunch of high-resolution photos of the cam lobes and sent them to me. They revealed only normal swirl wear patterns, with no evidence of significant distress. Mark next asked for a sit-down meeting with both Steve and his boss (the shop’s owner). He gave them each a copy of Continental SID05-1B, walked them though the pertinent language, described how he’d probed the lobes with his sharp dental pick, showed them his high-resolution photos, and argued that Steve had simply been wrong in his assertion that the cam was spalled. He also pointed out that the shop had removed two cylinders without his authorization, and then removed the entire engine without his authorization. Mark insisted that the shop reinstall the cylinders on the engine and reinstall the engine in the airplane at the shop’s sole expense. About a week later, Mark flew his airplane home from the shop, vowing never to return. On the flight home, he discovered the engine’s idle stop badly misadjusted and the propeller installed 180 degrees from the proper position. Rather than risk taking the airplane back to the Service Center, Mark decided to pay a local A&P to correct those two items. Over the coming weeks, Mark discovered that his problem with excessive oil consumption had vanished. The shop installed new rings on the #3 and #5 pistons before reinstalling the cylinders, and apparently that cured the problem that had prompted this painful misadventure in the first place. At least that was a pleasant surprise. The average owner-flown GA airplane flies less than 100 hours a year. I fly my Cessna 310 more than that, at least 120 hours a year. But I don’t fly it enough. In April, I flew to San Diego to give a talk at a FAASTeam safety event. I also made another flight to Camarillo to teach at the AOPA Regional Fly-In. In June, I flew from California to Knoxville, Tennessee, to attend and speak to the annual convention of the Flying Physicians Association and visit friends. Over the July 4th weekend, I made a quick trip to Los Angeles to attend a Pentatonix concert at the Hollywood Bowl. 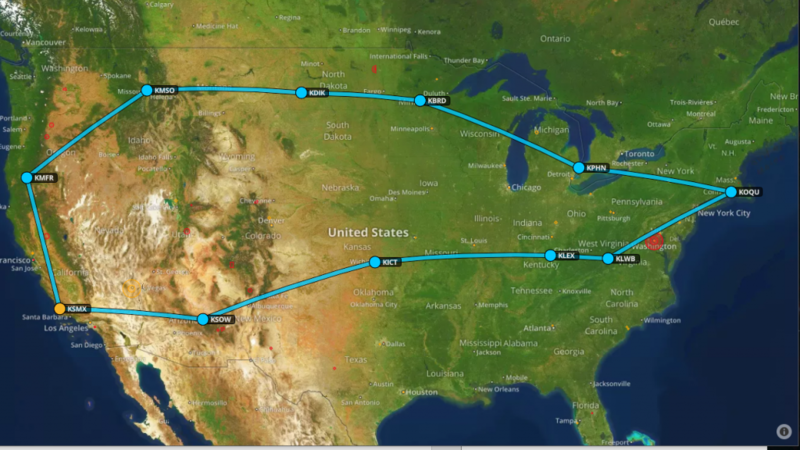 In late July, I made my annual pilgrimage to Oshkosh for AirVenture week, roughly 2,000 nm each way. In August, I was supposed to make a trip to Dallas for an expert witness deposition in an air crash case, but it was cancelled at the last minute when the case settled. 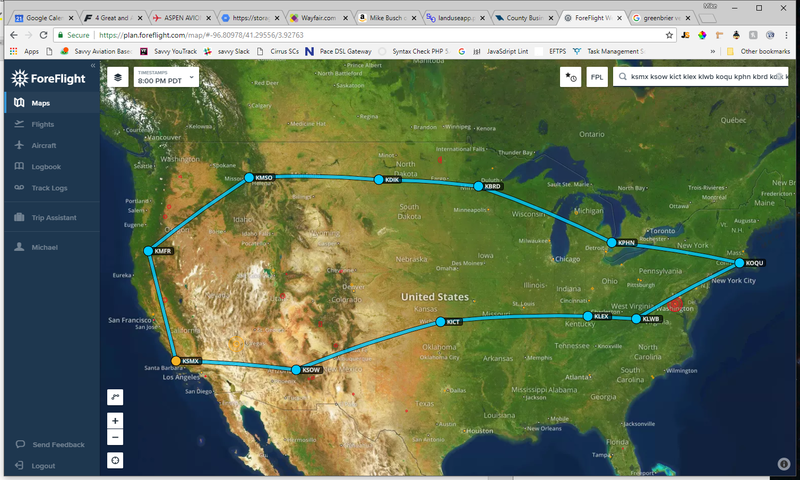 My 8,500 nm trip during Fall 2017. California to drop my brother-in-law at Chino, then have lunch with a friend at Hawthorne, and finally return to home base at Santa Maria. In early November, less than a week after returning home from this amazing 8,500 nm trip, I flew to Las Vegas, Nevada for my company’s annual corporate retreat…my final flight of 2017 in the Cessna 310. 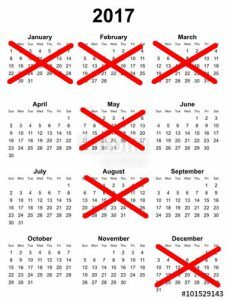 Months I didn’t fly my airplane during 2017. If you were paying attention, you’ll see the problem: I didn’t fly the plane at all during January, February, March, May, August, or December. The airplane just sat in its non-climate-controlled hangar located at KSMX roughly 8 miles from the Pacific Ocean. During those periods of extended disuse, the oil film had plenty of time to strip off the cylinder walls, cam lobes, and lifter faces of the two Continental TSIO-520-BB engines, exposing them to corrosive attack. The interior of the Cessna 310’s airframe—which is mostly shiny aluminum with no protective primer or paint—was also so exposed. This is not a good thing for the longevity of my airframe and especially my engines. I suspect my pattern of seasonal use is not uncommon. I suspect many GA airplanes based on less benign and temperate climates than what I have on the central coast of California might fly even more seasonally. 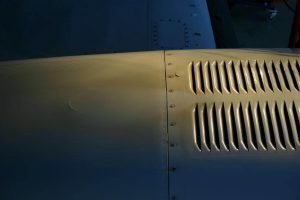 Certainly, airplanes based in humid coastal regions like Florida and the Gulf Coast are at even higher corrosion risk during their downtime periods. This problem is more serious than many aircraft owners realize. 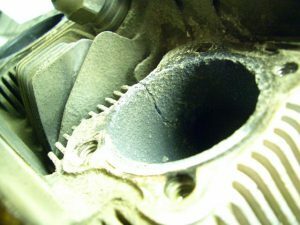 The #1 reason that piston aircraft engines fail to make TBO is cam and lifter corrosion, the presence of which almost always results to a premature engine teardown. This is a problem that’s almost exclusively confined to owner-flown GA airplanes. “Working airplanes” in flight schools, air charter, freight hauling, pipeline patrol, aerial surveillance, and similar kinds of operations almost never fail to reach engine TBO and often greatly exceed it. That’s because working airplanes fly every day or at least a few times a week, so they never lose the protective oil film that protects critical engine components from corrosive attack. Recognizing the risk created by my irregular pattern of flying, I’ve taken a few defensive steps to help mitigate the corrosion risk. I use a thick singe-weight oil (Aeroshell W100) that has the consistency of black strap molasses at room temperature and adheres to parts better than multigrade oils that are much thinner at room temperature (think Aunt Jemima Light). I use ASL CamGuard, which is the most effective anti-corrosion additive I’ve found (based on oil analysis results). In 2014, I installed nickel-carbide-plated cylinders on both engines, because they don’t rust like standard steel cylinders do. I keep my airplane hangared during periods of disuse. I fog the interior of the airframe with ACF-50 corrosion preventive compound every few years. All these things are helpful in mitigating the corrosion risk, but none are as effective as flying the airplane every week or two. So, my New Year’s resolution is to try my best to fly at least once every two weeks during 2018. “How many of you have had a problem with nose wheel shimmy?” Invariably, virtually every owner in the audience raised their hand. Usually, at least half the hands remained up. That was not a very reassuring sign about the competence of the mechanics these owners were using to maintain their Cessnas. Cessna nose wheel shimmy is very common, but it can be corrected and shouldn’t be accepted as normal. A mechanic who dismisses a problem like nose wheel shimmy as “the nature of the beast” and claims that “all Cessnas do that” is just copping out. If a mechanic tells you something like this, you’d be wise to seek a second opinion (and perhaps to change mechanics). To the best of my knowledge, nobody ever died because of uncorrected nose wheel shimmy. But from time to time, a mechanic dismisses a genuinely serious problem with “don’t worry about it, they all do that.” And that’s scary. 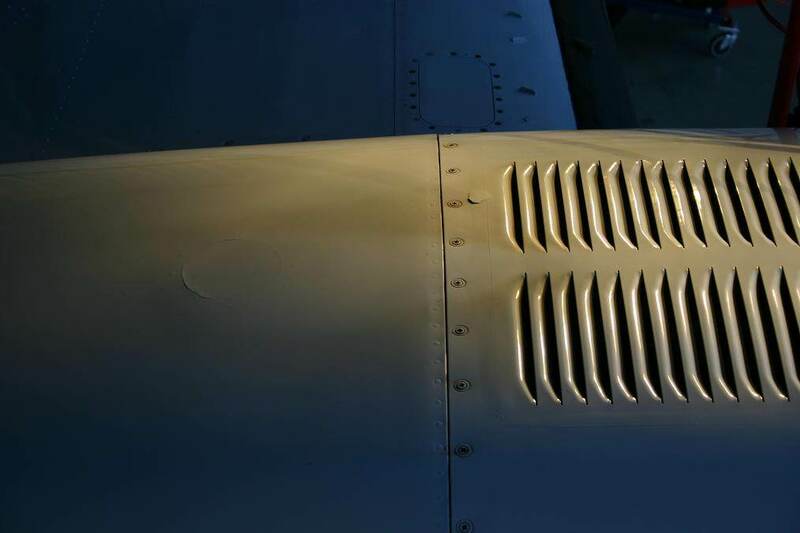 An owner of a Cessna T310R noticed gritty brown stains developing on top of his left engine nacelle aft of the louvers. He also noticed some cracking and bubbling of the paint. No such symptoms were apparent on his right nacelle. 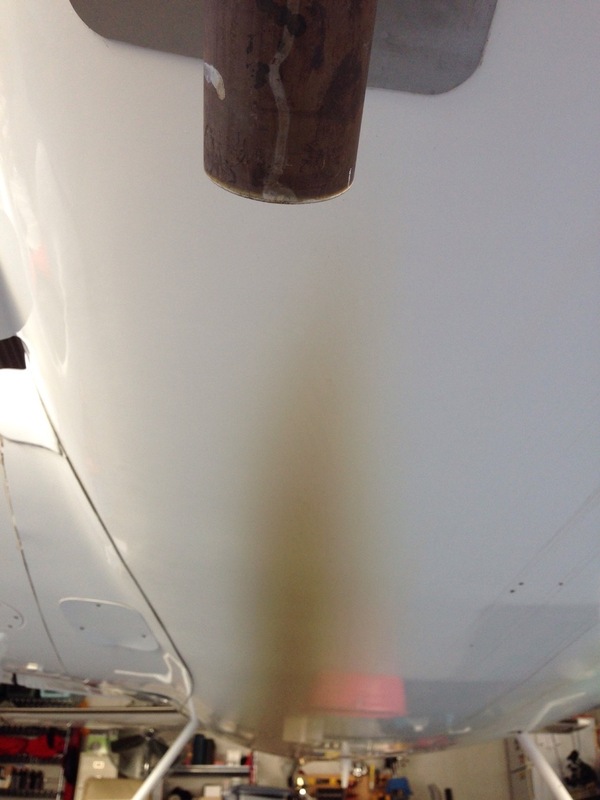 These brown exhaust stains on the top cowling of a Cessna turbo 310 are NOT normal! Several A&Ps told the owner not to worry about it, because “almost every twin Cessna has some degree of heat staining.” But it still worried the owner because he was seeing these stains only on the left necelle and not on the right. The owner then did a very smart thing: He sought a second opinion by posting a query online to a twin Cessna message board. I saw his post there, and asked him if he would take some digital photos of the brown stains and upload them to the forum so I and others could take a look at them. The next day, the owner posted some photos of the brown stains on the forum. I replied that I thought that those stains were probably symptomatic of a substantial exhaust leak in the vicinity of the turbocharger, and that I considered it imperative that he have the exhaust system in that area inspected thoroughly and the cause of the leak identified and remedied right away. Not long afterwards, the owner removed the top cowling from his left engine nacelle and took several more digital photographs, which he posted to the forum. One of those photos showed considerable white powdery deposits on the turbocharger heat shield and firewall. I told the owner that this almost certainly was confirmation that he had a significant exhaust leak at or near the turbocharger. Several other owners and mechanics chimed in and urged that the owner take this situation seriously. These white stains on the firewall and turbocharger heat shield are indicative of a significant exhaust leak. The next day, the owner cleared his calendar and took his airplane back to the shop. “I got some raised eyebrows when I insisted that we pressure-test the system,” the owner reported. The owner decided to stick around through the procedure to make sure the exhaust system was checked thoroughly for leaks. When the mechanic pressurized the exhaust system with shop air and started squirting soapy water on the exhaust plumbing, it was immediately apparent that there was a major leak at the junction of the turbocharger and the tailpipe. “We saw bubbles the size of a man’s fist forming between the tailpipe and the turbo,” the owner said. The mechanic discovered that the V-band clamp that secures this joint was extremely loose. 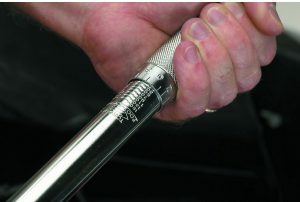 The nut on the clamping bolt could be tightened a full half-inch. But even after tightening the clamp, a second pressure test showed little improvement in the leak. The mechanic then removed the clamp, separated the tailpipe from the turbo, cleaned the mating flanges on both the tailpipe and the turbocharger, and then reinstalled the tailpipe and clamp. A third pressure test showed no leakage whatsoever at the joint. 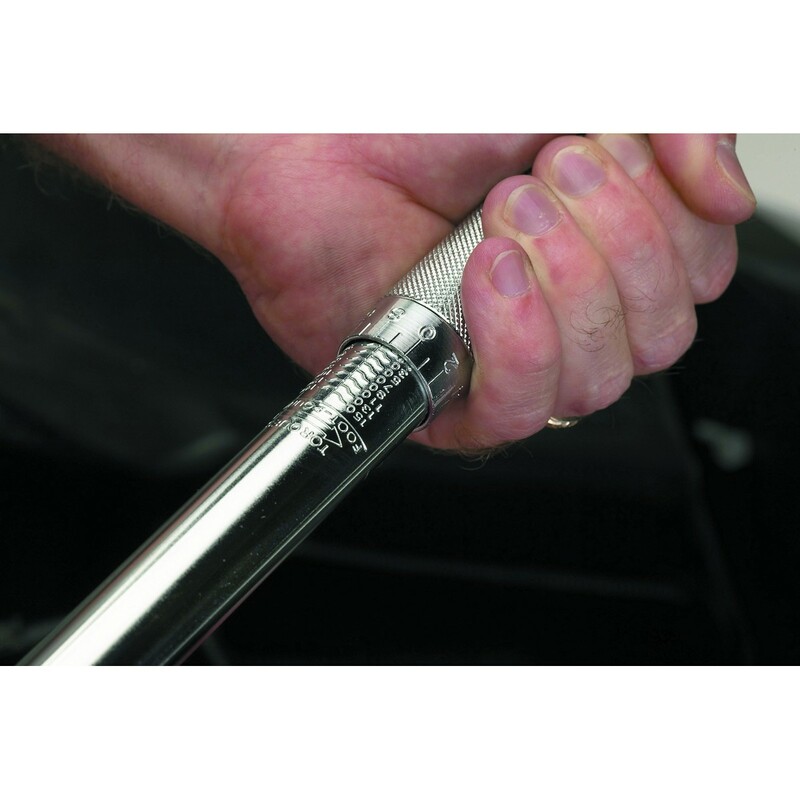 When securing exhaust V-band clamps, the use of a torque wrench is absolutely essential. Nope, reported the owner, the A&P didn’t use a torque wrench. “After your mechanic cleaned up the flanges on the turbocharger and tailpipe, the flanges should have been inspected with a strong light and magnifier for cracking,” I added. “Redo it,” I advised the owner, adding that when the nut is tightened “by feel” it’s invariably overtightened, putting excessive stress on the clamp in increasing the likelihood of clamp failure (which could be fatal). I pointed out that the torque is so important that each V-band clamp has a small stainless steel “torque tag” on which the correct torque is stamped. The owner put his plane back in the shop to have the clamp retorqued, and resolved that in the future he would take his maintenance business to another shop where the mechanics were more knowledgeable about turbocharged aircraft. The moral is this: Any time you ask a mechanic about some mechanical discrepancy and get the response “they all do that” or “it’s the nature of the beast,” consider this a big red flag, and go get an expert second opinion. Doing so might just save your bacon.